A new technical means is provided that can be produced and prepared at low cost, and in which the generation of stagnation in the flow of a liquid sample can be suppressed, microbeads can be smoothly and simply injected, filled and transported and the generation of dust can be also suppressed and a new extracting method for nucleic acid using the new technical means is provided. A microchip has amicrochannel (3) formed by groove parts (11, 21) provided in connecting surfaces of upper and lower substrates (1, 2). In the microchannel (3), a gap part (31) in which the section of the channel is reduced is provided in a central part upward and downward, rightward and leftward, or upward and downward and rightward and leftward the section thereof, and microbeads are checked. 本发明涉及微芯片、用于提取核酸的试剂盒以及核酸的提取方法。  The present invention relates to the microchip, as well as kits for nucleic acid extraction method for the extraction of nucleic acids. 本申请要求以于2003年3月M日在日本提交的日本专利申请2003-081605为优先权，通过参考将其应用于本申请。  This application claims priority to Japanese Patent March 2003 M filed priority on Japanese Patent Application 2003-081605, which is applied by reference herein. 通常，已知微芯片技术采用微细加工技术如平板蚀刻（lithography)等，在基底如玻璃的表面上形成深100 μ m且宽约500 μ m或更小的沟槽，该沟槽被用作液体或气体的微通道，以便进行化学反应、生化反应、溶剂萃取、气液分离，以及在此基础上进一步进行微量组分化学分析或非接触式光学分析。  Conventionally, micro-chip technology using micromachining techniques such as etching plates (Lithography) and the like, is formed on a 100 μ m deep as the surface of a glass substrate and a width of 500 μ m or less, a trench analysis is used as a liquid or gas microchannels for chemical reaction, biochemical reaction, solvent extraction, liquid separation, further minor components and chemical analysis on the basis of a non-contact optical. 就微芯片技术而言，本申请的发明人也提出一种测量方法，将作为反应载体的微珠插入微通道，并在微通道中设有坝型检测部（文献1)。  For micro-chip technology, the present application have also proposed a method for measuring the invention, the insertion reaction microchannel beads as a carrier, and a dam-type detection unit (Document 1) in the microchannel. 随着分子遗传学或分子生物学的最新进展，以及其应用扩展到医疗保健领域，从液体样品中提取核酸已成为一个非常重要的问题。  With the recent advances in molecular genetics or molecular biology, as well as the health care field to extend its application to extract nucleic acid from a liquid sample has become a very important issue. 因此，已经研究采用微芯片技术来提取核酸。 Thus, micro-chip technology has been studied using the extracted nucleic acid. 迄今，已提出采用二氧化硅珠的方法、采用二氧化硅微柱的方法或采用二氧化硅膜的方法（文献2-4)。 Hitherto, a method has been proposed using silica beads, fine silica column using a method or a method (Document 2-4) silicon dioxide film. 然而，在常规的微芯片技术中，例如通过采用二氧化硅微柱或二氧化硅过滤器来提取核酸的方法，都具有这样的的基本问题，即不期望的高成本，并且当二氧化硅微柱或二氧化硅过滤器被污染时，它们不能用新的微柱或新的二氧化硅膜来代替。  However, in the conventional micro-chip technology, for example, methods for extracting nucleic acids by using a silica or silica micro-column filter, has such a fundamental problem that high cost is not desirable, and when when silica or silica micro-column filter is contaminated, they can not use new or new micro-column instead of the silicon dioxide film. 此外，在现有的采用微珠诸如二氧化硅等的方法中，高压是必需的，以便将微珠注入微通道。 Further, in the conventional method of using beads such as silica or the like, a high pressure is necessary to inject the beads microchannel. 因此，微通道不能轻易地用珠填满。 Thus, the micro-channel can not be easily filled with the beads. 在采用坝型检测部拦截微珠的常规方法中，在液体样品的流动过程中容易引起停滞，因而难以平稳方便地输送诸如二氧化硅等的微珠。  In the conventional method of using the dam-type detecting unit interception of beads, during flow of the liquid sample likely to cause stagnation, it is difficult to smoothly conveniently delivered beads such as silicon dioxide or the like. 此外，通常情况下，当通过采用以玻璃或石英作为微芯片的基底而形成微通道时， 在通道中容易产生灰尘，并且特别难以清除灰尘。  Further, usually, when the microchannels are formed by using quartz glass as a substrate or microchip, prone to dust in the channel, and particularly difficult to remove dust. 下面显示了相关的文献。  The following shows the relevant literature. 这些文献作为参考应用于本申请。 These documents applicable to the present application by reference. 2 :L. Ceriotti et al. , (2002) Proceedings of the micro TAS 2002 symposiumNara, pp. 2:. L Ceriotti et al, (2002) Proceedings of the micro TAS 2002 symposiumNara, pp..
 3 :J. Kim et. al. , (2002)Proceedings of the micro TAS 2002 symposium,Nara, pp. 224-226 ο  3:.. J Kim et al, (2002) Proceedings of the micro TAS 2002 symposium, Nara, pp 224-226 ο..
 4:Q. Wu et al. ， (2002)Proceedings of the micro TAS 2002 symposium,Nara, pp.198-200。  4:. Q Wu et al, (2002) Proceedings of the micro TAS 2002 symposium, Nara, pp.198-200..
 因此，为了解决相关领域的上述问题，本发明的一个目的就是提供一种新技术的微芯片，以及一种采用该微芯片的核酸提取新方法，其中所述新技术作为采用微珠的微芯片技术可以以低成本进行生产和制备，可以抑制在液体样品流动过程中的停滞(stagnation)产生，可以平稳简单地注射、填充和输送微珠，并且也可以抑制灰尘的产生， 其中所述微珠不仅能有效地用于提取核酸，而且也可用作各种类型的反应载体。  Accordingly, in order to solve the above problems of the related art, an object of the present invention is to provide a new technology of the microchip, and a microchip using the new method of extracting nucleic acid, wherein the use of microbeads as a new technique the micro-chip technology may be prepared and produced at low cost can be suppressed stagnation (stagnation) in the liquid sample flows during the generation, simply can be smoothly injected, filling and transport the beads, and the generation of dust can be suppressed, wherein said microbeads only effective for extracting nucleic acids, but also various types of reactors can be used as carrier. 为实现上述目的，根据本发明的微芯片具有由设在上下基底的连接面中的沟槽部形成的微通道，该微通道设有间隙部，所述间隙部使得在截面的上下、左右以及上下左右的中间部的通道截面减小。  To achieve the above object, according to the present invention, the microchip having a micro channel formed by a groove portion provided on the upper and lower connecting surface of the substrate, the gap portion of the micro channel is provided, so that the gap portion in the vertical cross-section , the left and right channel cross-section and an intermediate portion of reduced vertical and horizontal. 该间隙部可由沟槽部中的凸出部形成。 The gap portion is formed by the projecting portion of the groove portion. 此外，该间隙部可以由分别设在上下基底内的沟槽部中的对向设置的凸出部形成。 Further, the gap portion may be formed by the convex portion provided on the groove portions are provided in the upper and lower substrates in. 而且，间隙部可以通过将一个基底的凸出部插入到另一基底的沟槽部中而形成。 Further, the gap portion by the convex portion inserted into the groove of a substrate to another portion of the substrate is formed. 此外，间隙部的截面尺寸可以通过上下基底的至少一个可移动凸出部而改变。 Further, the cross-sectional size of the gap portion may change at least one movable substrate by vertically projecting portion. 更进一步，间隙部的截面尺寸为可以拦截插入微通道中的微珠所需的尺寸。  Still further, the cross-sectional size of the gap portion is inserted into a desired size can intercept microchannels microbeads. 微通道的内壁表面可以用表面处理剂修饰。 Inner wall surface of the microchannel may be modified with a surface treating agent. 更进一步，根据本发明的用于提取核酸的试剂盒包括：上述微芯片和具有表面羟基的微珠。  Still further, according to the present invention, a nucleic acid extraction kit comprising: the microchip having surface hydroxyl groups of the beads. 具有表面羟基的微珠为直径10 μ m或更小的二氧化硅微珠、中空的二氧化硅微珠和树脂微珠中的至少一种。 Beads have a surface hydroxyl group is 10 μ m or less diameter silica beads, at least one silica beads and the resin beads in the hollow. 在内壁表面上具有表面羟基的微芯片的微通道中，表面羟基可以通过表面处理剂进行被覆处理。 Microchannel chip having surface hydroxyl groups on the inner wall surface, the surface hydroxyl groups can be treated by coating the surface treating agent. 该表面处理剂为一种硅烷偶联剂（coupling agent), 其含有三烷基卤代硅烷作为一种主要组分。 The surface treating agent is one silane coupling agent (coupling agent), trialkyl halosilane containing as a major component. 此外，一种用于核酸的提取方法采用了用于提取核酸的上述试剂盒。  Further, a method for extracting nucleic acids using the above kit for extraction of nucleic acids. 待处理液体中的核酸被吸附到微芯片的微通道中的微珠表面上。 The liquid to be treated in a nucleic acid is adsorbed onto the surface of the microbeads microchannels in the microchip. 更进一步，在存在离液序列高的离子的条件下，核酸可以被吸附到微珠表面上。 Still further, in the presence of a high chaotropic ion, the nucleic acid can be adsorbed onto the surface of the microbeads. 图1的分解透视图，示意性地显示了一个微芯片。 An exploded perspective view  FIG. 1 schematically shows a microchip. 图2A和2B为从图1中的方向A和B所观察到的间隙部31的截面图。  Figures 2A and 2B is a sectional view of the gap portion 31 is viewed from the direction in FIG. 1 A and B to. 图3A-3C的截面图显示了其它实例的间隙部31。  Figures 3A-3C show a cross-sectional view of another example of a gap portion 31. 图4A和4B的截面图显示了另一间隙部31的一个实例。  Figures 4A and 4B show a cross-sectional view of another example of the gap portion 31. 图5为光学显微镜照片的示意图，其示例作为一种实施例的DNA的吸附。  FIG. 5 is a schematic diagram of an optical microscope photograph, which as an example of an embodiment of adsorbed DNA. 现在将参照附图描述根据本发明的微芯片、用于提取核酸的试剂盒以及核酸提取方法的一种实施式。  will now be described with reference to the accompanying drawings microchip according to the present invention, a kit for nucleic acid extraction and one embodiment of Formula nucleic acid extraction method. 图1和2示意性地显示了根据本发明的微芯片的局部结构。  Figures 1 and 2 schematically shows a partial structure of the microchip according to the present invention. 图1显示了下基底1 与上基底2分开的状态。 Figure 1 shows the upper substrate 1 and lower substrate 2 separated state. 图2显示了从图1所示的箭头A和B标记的方向观察，间隙部31 的局部截面图，其中当上下基底1和2连接在一起时，该间隙部设在微通道3中。 Figure 2 shows the direction of arrows labeled A and B shown in FIG observation, a partial sectional view of the gap portion 31, wherein when the upper and lower substrates 1 and 2 are connected together, the gap portion 3 provided in the microchannel. 例如，在图1和2所示的微芯片中，微通道3由设在上下基底1和2的连接面中的沟槽部11和21形成。  For example, in the microchip shown in FIGS. 1 and 2, the microchannel portion 3 is formed by a groove provided on the connecting surface of upper and lower substrates 1 and 2, 21 and 11. 在微通道3中，设有使得截面的上下的中央部的通道截面减小的间隙部31。 In the microchannel 3 is provided such that the vertical cross section of the passage section of the central portion of the gap portion 31 is reduced. 更具体地，在图1和2所示的实施例中，上下基底1和2的沟槽部11和21相互对向设置以形成微通道3。  More specifically, in the embodiment shown in FIG. 1 and 2, the upper and lower substrates 1 and 2, groove portions 11 and 21 disposed opposite to each other to form the microchannels 3. 分别设在沟槽部11和21中的凸出部12和22相互对向设置以形成间隙部31。 Convex portions are provided in the groove portion 11 and 21 to 12 and 22 to each other is provided a gap portion 31 is formed. 间隙部31可以位于微通道3截面的中间部分，所述间隙部不仅可以位于截面上下的中间部分，如同图2所示的狭缝型孔，而且也可以位于截面左右的中间部分，例如，如图3A示意性地显示的那样，或者在截面上下左右的中间部分，如图;3B所示。  The gap portion 31 may be located at an intermediate portion 3 of the microchannel cross section, not only the gap portion in the middle portion of the vertical cross section, a slit-shaped hole as shown in FIG. 2, but may be located in the middle part of the left and right cross-section, For example, in FIG. 3A schematically shows, in the middle part or the left and right vertical cross section, as shown; FIG 3B. 应当理解，间隙部31的截面可以为各种形状。 It should be appreciated that the gap cross-section portion 31 may have various shapes. 例如，如图3C所示，间隙部的截面可以为圆形。 For example, as shown in FIG. 3C, the cross section of the gap portion may be circular. 通过用于形成微芯片的沟槽部11和21以及其凸出部12和22的微细加工方法或其条件，以及注入微通道等中的微珠的种类或尺寸，可以确定这些形状。 By forming a groove portion 11 and the microchip 21 and the type or size of the projections which microfabrication methods or conditions of 12 and 22, and the injection of the microchannel like beads, these shapes may be determined. 间隙部31可以不由分别设在上下基底1、2的各沟槽部中11和21中的凸出部12 和22形成。  The gap portion 31 may not be separately provided in each of the upper and lower substrates 1 and 2, the groove portions 11 and convex portions 21 12 and 22 are formed. 例如，如图4所示，微通道3本身例如由设在下基底1中的沟槽部11形成。 For example, as shown in FIG microchannel portion 3 itself, for example, by a groove provided in the base 11 is formed in a lower 4. 上基底2设置成一个盖板。 On the substrate 2 is arranged a cover plate. 在微通道3的结构中，设在上基底2中的凸出部23插入沟槽部11 中。 In the structure of the micro projection portion of the channel 3, on the substrate 2 is provided in the portion 23 is inserted into the groove 11. 凸出部23与沟槽11中的凸出部12相互对向以形成间隙部31。 The projecting portion and the projecting portion 23 in trenches 11 12 opposed to each other at a gap portion 31 is formed. 应当理解，除了由上述凸出部12、22和23组成的结构外，间隙部31可以具有各种结构。  It should be understood that in addition to the structure by the projections 12, 22 and 23, the gap portion 31 may have various structures. 而且，这些凸出部12、22和23不仅可采用微细加工方法通过对基底1和2进行平板蚀刻（lithography etching)形成，而且也可以例如通过聚合物的硬化而形成。  Further, the projections 12, 22 and 23 can be not only formed by a microfabrication technique of plate 2 and the substrate 1 is etched (lithography etching), but may be formed, for example by hardening of the polymer. 此外，可以由相对于微通道3在外部的微型元件的作用，或者可以将微通道3本身变形来形成间隙部31。 Further, the microchannel 3 with respect to the external action of the micro-elements, or may be itself a microchannel 3 is formed a gap portion 31 to deform. 在任一种情况下，在根据本发明的微芯片中，微通道3或间隙部31可以简单地以低成本来生产和制备。  In either case, the microchip according to the present invention, the microchannel 3 or gap portion 31 can be simply produced at low cost and prepared. 而且，由于间隙部31设在微通道3截面的中间部分，当将微珠注入微通道3时，可以抑制在流体如液体或气体的流动过程中产生停滞，可以平稳简单地注射微珠，并且也可以拦截微珠。 Further, since the gap portion 31 is provided at an intermediate portion of the cross section of the microchannel 3, the beads when injected into the microchannel 3, it is possible to suppress the occurrence of stagnation in the fluid flow process, such as a liquid or gas, can be smoothly injected simply microbeads, and you can also block beads. 当如上所述使用微珠时，设在微通道3中的间隙部31具有可拦截注入微通道3的微珠的截面尺寸。 A gap portion  When using beads as described above, provided in the microchannel 31 having a sectional dimension of 3 can be injected into the microchannels to intercept beads 3. 此外，例如可考虑移动上述凸出部或与凸出部具有相同功能的元件，从而可以改变间隙部的截面尺寸31。 Further, for example, consider the movement of the projecting portion or the projecting portion having the same function element, which can change the cross-sectional dimension of the gap 31. 在其截面尺寸发生改变的间隙部31中，拦截微通道3中的微珠后，截面可大大增加，从而微珠可以移动到下游区域。 In the cross-sectional dimension which the gap portion 31 is changed, after the beads 3 intercept the microchannel cross section may be greatly increased, so that the beads can be moved to the downstream region. 通常，为了排出微珠，需要从与注射方向相反的方向排出微珠。 Typically, in order to discharge the microbeads, microbeads required to be discharged from the opposite direction to the direction of injection. 然而，在其截面可改变的间隙部31中，可以在与注射方向相同的前进方向排出微珠。 However, in the gap portion 31 may vary in cross section, the beads can be discharged in the same direction in the traveling direction of the injection. 例如，在如上所述的根据本发明的微芯片中，根据其使用目的、物体的类型或性能，内壁表面可以采用表面处理剂修饰，从而使得样品原料、杂质、灰尘等不粘附到微通道3。  For example, in the microchip of the present invention, depending on its purpose, the type or performance, the inner wall surface of the object may be modified using a surface treatment agent such that the sample material, impurities, dust and the like does not adhere as described above 3 microchannel. 例如，在由玻璃或石英制成的微芯片的情况下，表面羟基通常存在于微通道3的内壁表面上。 For example, in the case of the microchip made of glass or quartz, the surface hydroxyl groups normally present in the inner wall surface of the microchannel 3. 因此，表面羟基有可能连接到核酸，从而使原料诸如核酸等很难被提取和分离。 Thus, it is possible to connect to the surface hydroxyl groups of nucleic acid, such as nucleic acids and the like so that the raw material is difficult to be separated and extracted. 在这种情况下，将表面羟基用表面处理剂有效地被覆，以使表面羟基失活。 In this case, the surface hydroxyl groups with a surface-treating agent effectively covered, so that the surface hydroxyl groups inactivation. 根据本发明的微芯片与微珠结合以获得一种特别有用的试剂盒，所述试剂盒可用于常见的化学合成或分析。 The microchip of the present invention bind to the microbeads to obtain a particularly useful kits, the kit can be used in common chemical synthesis or analysis. 具体是，在本发明中，提供了一种这样的试剂盒，其为用于提取核酸的试剂盒，该试剂盒包括上述微芯片和具有表面羟基的微珠。 Specifically, in the present invention, there is provided a kit such that the nucleic acid extraction kit was used, the kit includes the microchip and the beads have surface hydroxyl groups. 在这种情况下，对于具有表面羟基的微珠，优选直径为10 μ m或更小的二氧化硅微珠、中空的二氧化硅微珠以及由树脂诸如表面上添加有羟基的聚苯乙烯等制成的珠。  In this case, the beads have surface hydroxyl groups, preferably having a diameter of 10 μ m or less, silica beads, hollow silica microspheres and added with hydroxyl groups on the surface of a resin, such as beads made of polystyrene and the like. 根据其比重水平，直径为10 μ m或更大的二氧化硅微珠几乎不能在微通道3中得以输送。 The specific gravity levels, having a diameter of 10 μ m or larger silica beads hardly in the microchannel 3 is conveyed. 而且，在根据本发明的用于提取核酸的试剂盒中，对于具有表面羟基的微通道内壁表面，表面羟基优选用硅烷偶联剂被覆处理。  Further, in the extraction of nucleic acids according to the invention in a kit, the inner wall surface of the microchannel having surface hydroxyl groups, preferably hydroxyl groups covering the surface treated with a silane coupling agent. 最优选带有一个卤素原子的三烷基卤代硅烷，其为一种硅烷偶联剂，采用了由下述通式所代表的一种化合物。  The most preferred trialkyl halosilane with a halogen atom, which is a silane coupling agent, use of a compound represented by the following formula. 在这里，公式中的R1A2和R3代表相同或不同的烷基。  Here, the same or different and R1A2 formulas R3 represents an alkyl group. X代表卤素原子，如氯原子。 X represents a halogen atom, such as chlorine atom. 在硅烷化合物具有两个或多个卤素原子诸如氯原子等的情况下，有可能产生灰尘，不仅是由于卤素原子作为反应基团与内壁表面上的羟基发生反应，而且由于分子的聚合反应。 Having two or more halogen atoms, such as in the case of a silane compound such as a chlorine atom, it may produce dust, not only the hydroxyl groups on the reactive group reacts with the surface of the inner wall since the halogen atom as, but since the polymerization reaction of molecules. 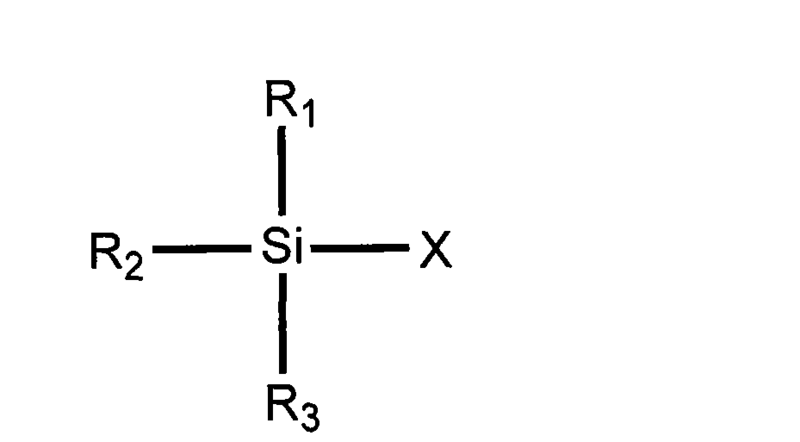 因此，制约着上述硅烷化合物的用途。 Thus, restricting the use of the silane compound. 作为一种核酸提取方法，例如，在图1和2所示的微芯片的实例中，从液体导入部4 注射包含微珠的液体。  As a method for extracting a nucleic acid, e.g., the microchip in the example shown in Figures 1 and 2, the liquid introduction portion 4 contains a liquid injectable microbeads. 在微通道3中，在间隙部31中拦截包含微珠的液体。 In the microchannel 3, the gap portion 31 in intercepting the liquid containing the beads. 随后，从液体导入部5导入样品以允许微珠吸附核酸。 Subsequently, the liquid sample is introduced from the introduction section 5 to allow the nucleic acid adsorbed beads. 残留的液体从排放部6排出，通过吸附使核酸得以提取。 The residual liquid is discharged from the discharge portion 6, to extract the nucleic acid by adsorption. 通过导入解吸液，可以使被吸附的核酸从微珠解吸。 By introducing desorbing liquid, a nucleic acid can be desorbed from the adsorbent beads. 随后，优选在存在离液序列高的离子的条件下提取核酸。 Subsequently, preferably in the presence of nucleic acid extraction from under chaotropic ions. 根据本发明，可以简单高效地提取核酸。  According to the present invention, simple and efficient extraction of nucleic acids. 现在，下面显示了实施例并进行了更具体地描述。  Now, the embodiments shown below and described more specifically. 应当理解，本发明不局限于下述实施例。 It should be understood that the present invention is not limited to the following examples. 准备一个由玻璃制成的微芯片（图1)，其具有直径为50 μ m且长60mm的微通道， 并在中间部分含有一个检测结构。  prepare a microchip made of glass (FIG. 1), having a diameter of 50 μ m and a length of 60mm microchannels, and a detection structure comprising the intermediate portion. 由微通道的上部和下部中的凸出部形成具有坝型拦截结构的间隙部。 A gap portion having a dam-type structure is formed by intercepting the upper and lower part of the projecting portion of the microchannels. 位于微通道中间部分的该间隙部形成垂直长度为2 μ m、水平长度为50 μ m的狭缝形状。 The gap portion is located an intermediate portion of the microchannel is formed perpendicular to a length of 2 μ m, 50 μ m horizontal length of the slit shape. 微通道的一部分用作注射部，并且另一部分用作排放部。 As part of the injection portion of the microchannel, and the other portion is used as the discharge portion. 在注射部设置一个液体容器，并且将一个微量管连接到排放部。 A liquid container is provided in the injection unit, and a micro-tube connected to the discharge portion. 组装一个实验系统，其中，注射泵连接到排放部的微量管，并且注入液体容器中的液体可以通过操作注射泵而吸出并注入微通道。 Assembling a test system, wherein the injection pump is connected to the discharge portion of the micro tube, and injecting the liquid in the liquid container may be aspirated with a syringe pump and injected into the microchannel. 在这里， 将悬浮在纯水中的微珠注入液体容器，并采用光学显微镜观察微珠在微通道中的输送。 Here, the beads were suspended in pure water injected into the liquid container, and observed by optical microscope microbeads conveyed in microchannels. 制备了二氧化硅微珠（直径为10 μ m或更小）、二氧化硅微珠（直径为10 μ m或更大）、中空的二氧化硅微珠（直径为2-20 μ m)和表面添加有羟基的聚苯乙烯微珠（直径为20 μ m)作为微珠。 Silica beads (having a diameter of 10 μ m or less), silica beads (having a diameter of 10 μ m or more), a hollow silica beads (having a diameter of 2-20 μ m) was prepared and a hydroxyl group added to the surface of polystyrene beads (diameter of 20 μ m) as the microbeads. 以10 μ 1/分的流速吸取包含微珠的液体。 At 10 μ 1 / min flow rate of a liquid containing suction microbeads. 除二氧化硅微珠（直径为10 μ m或更大）之外，所有微珠都令人满意地在微通道中输送并且可以在紧接拦截结构的间隙部前方的部分中形成珠柱。 In addition to silica beads (having a diameter of 10 μ m or more), the microbeads are all satisfactorily conveyed in microchannels and may form part of the gap portion in the bead column immediately in front of the intercepting structure. 另一方面，当采用直径为IOym或更大的二氧化硅微珠进行相同实验时，输送在微通道的半途中停止，从而不能充分地形成柱。 On the other hand, when the same experiment is performed with a diameter silica beads IOym or more, the delivery is stopped in the middle of the microchannel, whereby the column can not be sufficiently formed. 特别是，中空的二氧化硅微珠和表面添加有羟基的聚苯乙烯微珠可以令人满意地得以输送，如同二氧化硅纳米珠（珠直径为Iym或更小）那样。 In particular, hollow silica microspheres and the surface hydroxyl group is added polystyrene beads can be conveyed satisfactorily, as nano-silica beads (beads having a diameter of Iym or less) did. 当将纯水放入液体容器并注入微通道时，除二氧化硅微珠（直径为10 μ m或更大） 之外，所述微珠可以在微通道中输送并排放到注射泵。  When the water injection into the liquid container and microchannels, in addition to silica beads (having a diameter of 10 μ m or more), the beads may be delivered in a microchannel discharged to the injection Pump. 由玻璃或石英制作的微芯片的情况下，为防止核酸粘附到微通道的内壁表面，微通道内壁上的表面羟基需要被被覆。  The case of the microchip made of glass or quartz, to prevent adhesion of nucleic acids to the inner wall surface of the microchannel, the surface hydroxyl groups on the inner walls of the microchannel to be coated. 为了被覆表面羟基，广泛采用一种通过具有可与烷基反应的反应基团的硅烷偶联剂进行的表面修饰处理方法。 In order to cover the surface hydroxyl groups, is widely used for processing method can be modified by a surface having a reactive group with a silane coupling agent is an alkyl reactions. 因此，在微通道内壁的处理过程中，可通过采用硅烷偶联剂实现表面修饰过程。 Thus, the inner walls of the process microchannel, the coupling can be achieved by using a silane surface modification process. 然而，常用的十八烷基三氯硅烷具有三个氯原子作为用于修饰表面的反应基团，而且其不仅与微通道内壁上的表面羟基反应，还通过分子聚合形成聚合物。 However, conventional octadecyltrichlorosilane having three chlorine atoms as a surface modifying reactive groups, and which react with hydroxyl groups on the surface of the inner wall of the microchannel only, but also by molecular form polymer. 因此，十八烷基三氯硅烷分子相互反应形成聚合物，从而产生灰尘。 Thus, octadecyltrichlorosilane molecules react with each other to form a polymer, thereby producing dust. 不是在微通道而是在平的基底如幻灯片玻璃的表面修饰过程中产生的灰尘可采用溶剂冲洗，不会产生问题。 Dust is not produced in the microchannel but surface-modified glass slides in a flat substrate may be used during the solvent flush, without problems. 然而，在微通道内壁的修饰过程中产生的灰尘不能轻易地被洗掉。 However, the dust generated in the inner walls of the microchannel modification process can not be washed away easily. 当将拦截结构设在微通道中时，灰尘特别难清除。 When intercepted disposed in the microchannel structure, particularly difficult to remove dust. 在微通道中残留的灰尘不仅阻碍在微通道中输送液体或珠，而且在核酸的吸附过程中引起麻烦。 Remaining in the microchannel dust not only hinder the transport liquid or beads in a microchannel, and cause problems in the adsorption of nucleic acids. 此外，也广泛采用了二氯二甲基硅烷， 其具有两个氯原子作为反应基团。 In addition, the extensive use of dichlorodimethylsilane, having two chlorine atoms as the reactive group. 然而，二氯二甲基硅烷具有低沸点（70°C)和高挥发性， 因而其安全性很低。 However, dichlorodimethylsilane having a low boiling point (70 ° C) and high volatility, and therefore its safety is low. 而且，由于二氯二甲基硅烷具有两个反应基团，不能完全防止由于分子聚合而产生聚合物。 Further, since dichlorodimethylsilane having two reactive groups, can not completely prevent the molecules are polymerized to produce a polymer. 因此，研究了一种含有单个反应基团的表面修饰剂，原则上不产生聚合物，沸点高且挥发性低，具有高安全性，并且该液体在常温下可轻易地被处理。  Accordingly, a study of the surface modifier containing a single reactive group, in principle, produce a polymer, a high boiling point and low volatility, has high safety, and the liquid can easily be processed at room temperature. 例如，三乙基氯硅烷具有一个氯作为反应基团部分，并且原则上不产生聚合物。 For example, triethyl chlorosilane having a reactive group as a chloro moiety, and in principle, produce the polymer. 此外，由于三乙基氯硅烷的沸点为145°C且熔点为-50°C，在常温下，三乙基氯硅烷具有低挥发性。 Further, since the boiling point of triethylsilyl chloride is 145 ° C and a melting point of -50 ° C, at normal temperature, triethylsilyl chloride have a low volatility. 而且，由于三乙基氯硅烷为液体，三乙基氯硅烷很容易用溶剂如甲苯稀释，并且很容易被处理。 Further, since the liquid triethylsilyl chloride, triethylsilyl chloride easily diluted with a solvent such as toluene, and it is easily handled. 采用三乙基氯硅烷或十八烷基三氯硅烷进行了微通道内壁的表面修饰过程。  The triethylchlorosilane octadecyl trichlorosilane or the inner wall of the microchannel surface modification process. 以无水甲苯作为溶剂，分别制备它们的5%溶液。 Anhydrous toluene as a solvent to prepare a 5% solution thereof, respectively. 采用实施例1中描述的实验系统，比较两种溶液。 Using the experimental system described in Example 1, comparison of the two solutions. 将制备的溶液注入液体容器中并由注射泵抽吸，以便将溶液注入微通道。 The prepared solution was injected into the liquid container by a syringe pump suction, the solution was injected to the microchannel. 流动速率设10 μ 1/分，并且注射50 μ 1溶液以进行表面修饰。 Flow rate is set 10 μ 1 / min, and the injection was 50 μ 1 for surface modification. 随后，在表面处理后，注射50 μ 1或更多的无水甲苯以洗涤微通道。 Subsequently, after the surface treatment, injection of 50 μ 1 or more microchannels washed with dry toluene. 洗涤期间，采用光学显微镜观察微通道。 During the washing, the microchannel observed by optical microscope. 在十八烷基三氯硅烷中，微通道内生产灰尘，然而，在三乙基氯硅烷中，不生产灰尘。 In octadecyl trichlorosilane, the production of dust within the micro-channel, however, triethylsilyl chloride, the dust is not produced. 在三乙基氯硅烷中，将浓度进一步增加到10%并进行相同的过程。 In triethylsilyl chloride, the concentration further increased to 10% and the same procedure. 随后，未产生灰尘。 Then, the dust is not generated. 在实施例1中描述的实验系统被用于设法吸附核酸。  In the nucleic acid is adsorbed to try experimental system described in Example 1. 以与实施例2中描述的相同方式，采用10%三乙基氯硅烷处理微通道内壁的表面。 2 in the same manner as described in Example, 10% of surface-triethylsilyl chloride process microchannel inner wall. ColEl DNA被用作核酸。 ColEl DNA was used as a nucleic acid. 饱和碘化钠溶液被用作离液序列高的离子溶液。 Saturated sodium iodide solution was used as chaotropic ions from solution. 使0. 2g在实施例1中描述的微珠悬浮在1升碘化钠溶液中。 0. 2g in making the microbeads described in the Example 1 embodiment was suspended in 1 liter of sodium iodide solution. 从液体容器中将25 μ 1获得的溶液注入微通道以形成一个柱。 Solution will be injected into the microchannel from the liquid container 25 μ 1 obtained to form a column. 作为一种溶剂， 用碘化钠制备1 % DNA溶液，并且从液体容器将DNA溶液注入微通道。 As a solvent, 1% DNA solution prepared with sodium iodide, and the DNA solution is injected into the liquid container microchannel. 接着，将STORGreen I溶液作为DNA的荧光燃料，从液体容器注入微通道。 Subsequently, the solution was STORGreen I as the fluorescent DNA fuel injected from the liquid container microchannel. 当采用光学显微镜观察微通道时，辨认出仅二氧化硅微珠41的柱部分42发射荧光，如图5所示。 When using an optical microscope microchannel, identified only a column of silica beads 41 fluorescence emission portion 42, as shown in FIG. 辨认出DNA被实施例1中使用的二氧化硅微珠41吸附。 Example 1 Silica beads used in the embodiment 41 are identified DNA adsorbed. 除柱部分42之外，在微通道中未发现荧光，并且确定DNA未吸附到微通道的内壁表面上。 In addition to post portion 42, it is not found in the microchannel fluorescence, and determine the DNA is not adsorbed to the inner wall surface of the microchannel. 采用在实施例1中描述的实验系统检测了核酸的吸附和解吸。  The experimental system described in Example 1 for detecting the adsorption and desorption of nucleic acid. 该实验系统和如上所述的相同。 The same experimental system as described above. 将在实施例1中描述的微珠注入微通道以形成柱，并随后注射核酸。 Injected in the microchannel microbeads described in Example 1 to form a column, and subsequent injection of nucleic acid. 将Lambda DNA用作核酸。 Lambda DNA as the nucleic acid. 采用光学显微镜确定LambdaDNA到微珠的吸附。 Using an optical microscope to determine the adsorption LambdaDNA microbeads. 准备60°C或更高温度的热纯水，并从液体容器注入微通道。 Preparation 60 ° C or higher temperature hot water, and injected into the microchannel from the liquid container. 随后确定Lambda DNA从微珠解吸。 Lambda DNA is then determined desorbed from the microbeads. 如上所述，由于确定核酸可吸附到微珠并从微珠解吸，发现可以在微通道中实现核酸的提取。  As described above, since the determination may be adsorbed to the nucleic acid from the beads and microbeads desorption, extraction of nucleic acids can be achieved found in the microchannel. 本领域普通技术人员应当理解，本发明不局限于上述参照附图描述的实施例和例子，并且在不背离附属的权利要求及其主旨的前提下，可以进行各种改变、替代或等同实验。  One of ordinary skill will appreciate that the present invention is not limited to the embodiments described with reference to the accompanying drawings and examples of embodiments, and without departing from the spirit and the appended claims may be made various changes, substitutions, or equivalent experiment. 如上详细描述的，根据本发明，可以提供一种新的技术手段，其可以作为采用微珠的微芯片技术以低成本进行生产和制备，所述微珠不仅有效地用于提取核酸，而且可用作各种反应载体，并且所述新的技术方法可以抑制在液体样品的流动过程中产生停滞，可以平稳简单地注射、填充和输送微珠，并且也可以抑制产生灰尘。  As described in detail, according to the present invention can provide a new technology, which can be prepared at low cost production and use of microbeads as a micro-chip technology, the beads not only effective for extraction of nucleic acids , but also as a carrier of various reactions, and the new art method can suppress generation of stagnation during the flow of the liquid sample may be simply injected smoothly, filling and transport the beads, and the generation of dust can be suppressed. 此外，可以提供一种采用该新技术手段的新的核酸提取方法。 In addition, the new method of nucleic acid extraction technology may provide a means employed. 1.一种微芯片，其含有一个微通道，所述微通道由设在上下基底的连接面中的沟槽部形成，其中，所述微通道设有使得截面的上下、左右或上下左右的中间部的通道截面减小的间隙部，所述间隙部由分别设在上下基底内的沟槽部中的对向凸出部形成。 A microchip comprising a microchannel, the microchannel is formed by a groove portion provided on the upper and lower connecting surface of the substrate, wherein the microchannel has a cross section such that the upper and lower, left and right or up and down about the a gap section of the intermediate portion of the passage is reduced, the gap portion of the projecting portion is formed by the groove portions are provided in the upper and lower substrates in. 2.根据权利要求1的微芯片，其中，所述间隙部是通过将一个基底的凸出部插入另一基底的沟槽部中而形成。 The microchip according to claim 1, wherein the gap portion is formed by a base of the projection portion inserted into the other groove portion of the substrate. 3.根据权利要求1的微芯片，所述间隙部的截面尺寸可通过上下基底的至少一个可移动凸出部而改变。 3. The microchip according to claim 1, cross-sectional dimension of the gap portion may vary to at least one movable substrate by vertically projecting portion. 4.根据权利要求2的微芯片，所述间隙部的截面尺寸可通过上下基底的至少一个可移动凸出部而改变。 The microchip as claimed in claim 2, cross-sectional dimension of the gap portion may be changed by at least one movable projecting portion of the upper and lower substrates. 5.根据权利要求1的微芯片，其中，所述间隙部的截面尺寸为拦截插入微通道的微珠所需的尺寸。 The microchip according to claim 1, wherein a cross-sectional dimension of the gap portion is inserted to intercept the desired microchannel size beads. 6.根据权利要求2的微芯片，其中，所述间隙部的截面尺寸为拦截插入微通道的微珠所需的尺寸。 The microchip according to claim 2, wherein the cross-sectional size of the gap portion is inserted into a desired size to intercept the microbeads microchannels. 7.根据权利要求3的微芯片，其中，所述间隙部的截面尺寸为拦截插入微通道的微珠所需的尺寸。 7. wherein the cross-sectional dimensions of the gap portion is inserted to intercept the desired microchannel size of microbeads according to claim 3 of the microchip. 8.根据权利要求4的微芯片，其中，所述间隙部的截面尺寸为拦截插入微通道的微珠所需的尺寸。 The microchip according to claim 4, wherein the cross-sectional size of the gap portion is inserted into a desired size to intercept the microbeads microchannels. 9.根据权利要求1-8中任一项的微芯片，其中，微通道的内壁表面用表面处理剂修饰。 The microchip according to claim any one of 1-8, wherein the inner wall surface of the microchannel with a surface modification agent treatment. 10.根据权利要求9的微芯片，其中，所述表面处理剂为一种硅烷偶联剂，该硅烷偶联剂含有三烷基卤代硅烷作为一种主要组分。 The microchip according to claim 9, wherein said surface treating agent is a silane coupling agent, the silane coupling agent containing tris alkylhalosilanes as a major component. 11.根据权利要求10的微芯片，其中所述三烷基卤代硅烷是三乙基氯硅烷。 The microchip according to claim 10, wherein the trialkyl halo silane is triethylsilyl chloride. 12.一种用于提取核酸的试剂盒，包括：根据权利要求1-11中任一项的微芯片；以及具有表面羟基的微珠。 12. A kit for extraction of nucleic acids, comprising: a microchip of any one of claims 1 to 11; and a bead surface hydroxyl groups. 13.根据权利要求12的用于提取核酸的试剂盒，其中，具有表面羟基的微珠为直径为10 μ m或更小的二氧化硅微珠、中空的二氧化硅微珠和树脂微珠中的至少一种。 According to claim 12 for extracting a nucleic acid kit, wherein the microbeads have surface hydroxyl groups of 10 μ m in diameter or smaller silica beads, hollow silica microspheres and resin microbeads at least one. 14.根据权利要求12或13的用于提取核酸的试剂盒，其中，在内壁表面上具有表面羟基的微芯片的微通道中，所述表面羟基被覆有表面处理剂。 According to claim 12 or 13 for nucleic acid extraction kits, wherein the microchannel chip having a surface hydroxyl group on the inner wall surface coated with the surface hydroxyl groups of the surface treating agent. 15.根据权利要求14的用于提取核酸的试剂盒，其中，所述表面处理剂为一种硅烷偶联剂，该硅烷偶联剂含有三烷基卤代硅烷作为一种主要组分。 15. The kit of claim 14 for the extraction of nucleic acids, wherein said surface treating agent is a silane coupling agent, the silane coupling agent containing tris alkylhalosilanes as a major component. 16.根据权利要求15的试剂盒，其中所述三烷基卤代硅烷是三乙基氯硅烷。 16. The kit of claim 15, wherein the trialkyl halo silane is triethylsilyl chloride. 17.一种核酸提取方法，采用了根据权利要求12-16中任一项的用于提取核酸的试剂盒，其中，待处理液体中的核酸被吸附到微芯片的微通道中的微珠表面。 17. A nucleic acid extraction method, according to one employed for nucleic acid extraction kit according to any 12-16, wherein the nucleic acid in the liquid to be treated is adsorbed to the surface of the microbeads in the microchannel chip according to claim . 18.根据权利要求17的核酸提取方法，其中，在存在离液序列高的离子的条件下，核酸被吸附到微珠表面。 18. The nucleic acid extracting method of claim 17, wherein, in the presence of chaotropic ions, nucleic acids are adsorbed to the bead surface. Darwin R. Reyes, Dimitri lossifidis, Pierre-Alain Auroux,Andreas Manz.Micro total anlysis systems. 1. Introduction, theory, andtechnology.Analytical Chemistry74 12.2002,74(12),2629. Kelley A. Wolfe, Michael C. Breadmore, James P. Landers,.Toward a microchip-based solid-phase extraction method forisolation of nucleic acids.Electrophoresis23.2002,23727-733. Kiichi Sato, Manabu Tokeshi, Hiroko Kimura, TakehikoKitamori.Dtermination of carcinoembryonic antigen in human sera byintegrated bead-bed immunoasay in a microchip for cancerdiagnosis.Analytical Chemistry73 6.2001,73(6),1213-1218. Kiichi Sato, Manabu Tokeshi, Tamao Odake, Hiroko Kimura,Takehiko Kitamori.Integration of an immunosorbent assay system: analysis ofsecretory human immunogllbulin A on polystyrene beads in amicrochip.Analytical Chemistry72 6.2000,72(6),1144-1147.